I am an LDS wedding photographer that takes wedding photos at the Mesa Arizona Temple, Gilbert Arizona Temple, Phoenix Arizona Temple, Tucson Arizona Temple, Gila Valley Temple, Snowflake Temple and frequently at Temples in Utah and California. I have shot thousands of weddings at 34 different Temples throughout the world. Temple Only Package – $495.00. 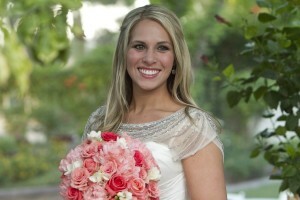 Includes custom photo session with just the bride and groom at Temple or other location of their choice. Usually lasts between 1 and 1.5 hours. Normally we would recommend this is done on a day different then the wedding day. Typically we would want to start this session about 1.5 hours before sunset. Also included is a photography session at the Temple with friends and family after the sealing. This normally lasts about 30 minutes. Temple & Reception Package – $995.00. Includes all of the above plus adds reception coverage. You should plan on starting your photography session at your reception approximately one hour before your guests arrive. This is when we would take formal family and bridal party photos. We then stay during the entire reception taking photos until the bride and groom drive off. Both packages include a USB thumb drive with all the images shot. You will have full rights to print at a lab of your choice. Engagement Photos – $295.00 – Add engagement photos to either package above.